24"W x 24"D (variable) x 43-67"H (pole height adjustable). 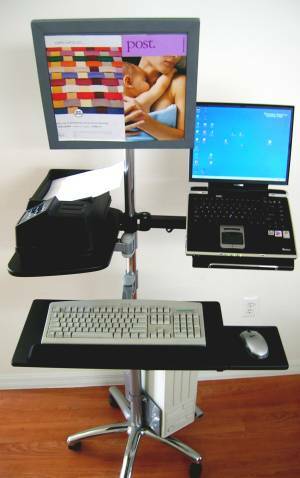 The DVC02 allows operating a computer workstation at the very point of need. All attachments are height adjustable along the chrome section of the pole. 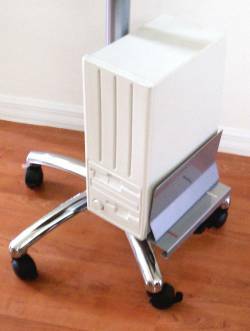 The height of this cart is adjustable from 43" to 67". The keyboard tray can be lowered down to 33" from the floor, which might be high for some users. An optional arm is available if you need a lower setting. 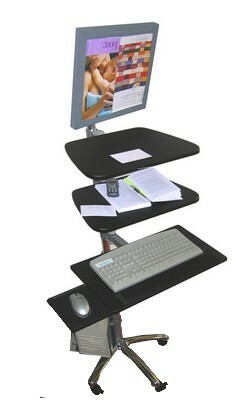 We also have the DVC03 Pole cart, where the keyboard setting can go down to 28". - (1) Shelf (swivels 180 degrees; height adjustable). - (1) Keyboard shelf (swivel 180 degrees; height adj. ), w/ slidable padded mouse-tray and ergonomic cushioned wrist-pad. 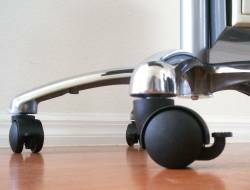 - (5) Casters, all with locks, on a chrome base. - NOTE: the CPU holder is not included. Is is an option (see below).